Keller has developed a universal, energy-optimised radio module with integrated data logger. The GSM-2 remote data transmission unit and the free PC software allow you to conveniently observe levels, measurements and trends and monitor limits. 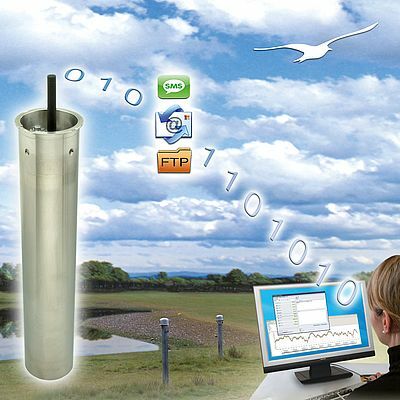 The cylindrical design of the GSM-2 with a diameter of just 48 mm has been chosen so that the data logger, which ”self-dials” in accordance with user requirements, can simply be placed in the top of a normal 2-inch diameter sounding pipe that is used in groundwater measuring equipment. Installation takes a matter of seconds. The housing is designed to withstand condensation and being under water for short periods. The GSM antenna is covered with a lockable covering cap made from solid plastic. The data logger is therefore protected from theft and vandalism when level measurements are being taken outdoors. Equipped with energy-efficient electronics and a robust lithium battery (3.9 V/32 Ah), the logger can send the results of 24 measurements to a PC at headquarters for up to 10 years by e-mail, or transfer them to a mobile phone via SMS. The maximum measuring speed is 1 measurement per minute. Two voltage inputs (0 - 2.5 V), 2 digital inputs, a BUS interface (RS 485) for operating up to 5 level sensors or optionally the SDI12 interface for water analysis units make the GSM-2 data logger a universal data acquisition module for wide area measuring networks. An air pressure sensor and a temperature sensor are already integrated in the GSM-2, especially for taking level measurements using pressure sensors with long-term stability such as the Keller 30 series. The actual sensor no longer has to be connected to the ambient air via a capillary tube in the supply cable. The measuring accuracies that can be achieved from the difference between the probe signal and the air pressure signal are within the range of a few millimetres. The GSM2 DataManager, which is flexible, convenient and free software, takes over the key functions of a monitoring, acquisition, control and organisation unit. The DataManager acquires the measurements, allocates them, displays them in graphical format, provides a signal when limits are exceeded and then stores them in a mySQL database for which no licence fee is required. Third parties can access the measurements using various export and Internet functions and integrate them in their data acquisition systems. All parameterisation and monitoring of the individual GSM-2 data loggers is also carried out using the GSM2 DataManager software.